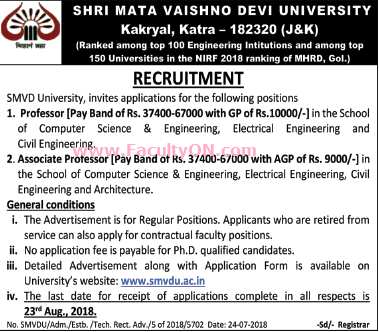 Shri Mata Vaishno Devi University, Katra has advertised in THE TIMES OF INDIA newspaper for recruitment of Teaching Faculty - Professors and Associate Professor jobs vacancies. Interested and eligible job aspirants are requested to apply on or before 23rd August 2018. Check out further more details below. About University: Akin to Brahma (God), who fosters and nurtures the Universe, science over the years has bestowed upon man god like powers, there by making him the dominant species on globe ''Vigyanam Brahma'' or ''God is Science'' is the motto Shri Mata Vaishno Devi University has been established through an act of J&K Legislature as an autonomous, fully residential and highly technical University of excellence with grant and continuing support from Shri Mata Vaishno Devi Shrine Board, Katra. Govt., of India has supported our projects and the industry has been closely involved in our R&D activities. Professor- Pay Band of Rs. 37400-67000, with AGP of Rs.10000/-. Application Fee: Application Form should be accompanied with application fee in the form of a DD of Rs.500/- drawn in favour of ‘Registrar, SMVDU’, payable at Katra/Kakryal /Jammu. However, no application Fee is payable for Ph.D. qualified candidates. How to Apply: Interested and eligible candidates are requested to apply in prescribed format downloaded from university website along with copies of certificates / testimonials, and recent PP size photos to the postal address provided here. Kakryal, Katra–182 320 (J&K), India.